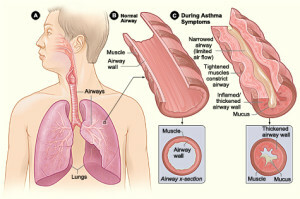 Asthma is a condition where there is reversible obstruction of the airways (small tubes in the lungs). Asthma can start at any age but the incidence is highest in children. There is usually a hereditary link in the development of asthma. There is often an allergic basis for the symptoms and many asthma patients also have other allergic conditions. Asthma is characterized by episodes of shortness of breath accompanied by wheezing. This is produced by a temporary narrowing of the bronchi (small tubes) by muscle spasm and secretions of mucus. The efficiency of the lungs is reduced and the patient may become very distressed. A typical episode of asthma, which may occur at any time, occurs suddenly and may be preceded by a ‘tight’ feeling in the chest. Breathing out (exhalation) becomes difficult and wheezing is heard. The following video from St John Ambulance (UK) demonstrates the first aid management of an asthma attack.